Most current nitrogen recommendation systems are completed early in the spring to provide fertilizer application advice for the entire growing season. However, these systems cannot take account of variations, which may occur during the growing season, which could affect the crop's nutrient requirements. N-Tester is a hand held tool, which enables quick and easy measurements to be taken through a growing crop to establish its exact nitrogen requirement. This enables variations in crop nitrogen demand to be determined during the growing season. The result is more accurate field scale nitrogen recommendations, improving profitability and minimizing environmental effect. Therefore the N-Tester is well accepted among farmers and official advisorsin many European countries. N-Tester operates by measuring the chlorophyll content of the leaf which is related to the nitrogen status of the plant. Thirty random measurements across the field gave an average value which is used to indicate how much nitrogen the crop requires. The N-Tester measurements are strongly influenced by crop variety and growth stage. For this reason the N-Tester measurements must be calibrated to take account of this variation. The N-Tester is calibrated for winter cereals. 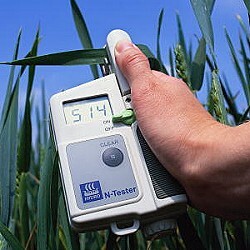 In addition the N-Tester is in use in many research programs on other crops. For further information regarding the N-Tester please contact Yara .